Anyone even remotely connected with the iron game will remember one of its greatest ambassadors, Dan Lurie. 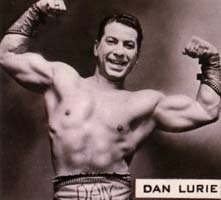 Back in the 40s and 50s, Dan carved a niche for himself as the worlds strongest, most muscular man. He went on to become arguably bodybuilding&apos;s most successful promoter, starting the World Body Building Guild in 1965 as a way to enhance public awareness, and garner respect, for a sport that was, at the time considered an oddity. Along the way, Dan published several health and fitness related magazines, the most popular of these being Muscle Training Illustrated. From bent pressing with one arm 285lbs, to arm wrestling President Regan, Dan has lived a colorful life, while continually preaching the bodybuilding gospel. Indeed, whether it be through promotion, television, competition, publishing or marketing, Dan took bodybuilding to the masses and helped to transform it from curious spectacle to legitimate sport. His contribution to bodybuilding should never be forgotten for he truly was, and is, one of its more passionate advocates. In the following interview Dan tells his inspiring story and shares the methods that have helped him to stay in excellent physical shape at age 82. Well Dave, I just spent the whole day with my son and we went to the Hall of Records in New York. I&apos;ll tell you something crazy Dave. I used to be partners with Joe Weider for several years in the early 1940s and we had a falling out in 1948. In 1947 I registered the name International Federation of Bodybuilders (IFBB) and I held the first IFBB contest on January 15, 1948. "This was the first IFBB show in America. So I came up with the name, but had forgotten about it for 55 years until my son accidentally found the program for that contest, and what we are trying to prove now is that Joe Weider stole the name from me." The IFBB became very famous, but I was the first one to come up with the contest and use the name. So I went to City Hall to find all the records for 1947 - very interesting. And what do you hope to achieve if you can prove you came up with the name? My wife says, "what are you going to get out of it". If I discovered the airplane, and was the first one to fly the airplane, and they said, "no it was the Wright Brothers who did it", how would I feel? I am just hoping to get the recognition I deserve. I was forgotten in this field for so many years and would like some acknowledgement. Your resume is quite an impressive one and you have been involved in bodybuilding for some time. How old are you and what kind of shape are you in now Dan? I am 82 years young! On April 1, 2006, I will be 83 years young. I am in good shape right now. I workout every morning and I don&apos;t overdo it. I use about 50 lbs and do a lot of repetitions. At what age do you feel you reached your peak as a bodybuilder? At the 1945 Mr America show. Bob Hoffman ran this show and for four years he had everyone from York win the contest. I always wanted to win America&apos;s most muscular man. I did this three times. No one in the world has ever done this three times. In 1945 they had me disqualified saying I was a professional. It was because I was getting too good and was in partnership with Weider. He didn&apos;t want us to get too strong and competitive. They got the AAU to make me professional and I quit competing. You know what happens today when you quit competing. You don&apos;t train like you used to train. In my case I got married. I always worked out, but not with the intensity of one who is competing. I had nothing to prove anymore. How did you get started in bodybuilding Dan? What gave you your big break? I trained for three years at the age of 13 and, at this time, the Daily News in New York was running the Golden Gloves boxing tournament. They put you in all the local arenas and at the end the main show would be at Madison Square Garden. Well I trained for three years and was a pretty good boxer. "Don&apos;t cry kid, I used to be a good boxer but sooner or later someone comes along and beats the dickens out of you so you are better off if you don&apos;t fight." He told me I had good muscular development and suggested I go into bodybuilding. You know what I said to him? What&apos;s bodybuilding? His name was Terry Robinson and he was Mr. New York State. He will be 90 years old on March 9, 2006. He gave me directions to my first gym with weights. Terry Robinson was a great man. He raised Mario Lanza&apos;s three children. He was the first one to know when Mario died in Italy. He raised Mario&apos;s children after Mario&apos;s wife died a couple of months later of a broken heart. Terry lives in California. He was my mentor and he gave me the direction I needed at that time. So I went into bodybuilding and entered my first New York City contest. I was so bad I came out last. I thought... these guys are monsters, what am I doing here. I was only 17 at the time. But by the time I was 19, in 1942, I was first runner up at the AAU Mr. America contest. They gave me a lot of body part awards and America&apos;s most muscular man title after that. How did you prepare for your first show? What sort of mistakes did you make initially? I didn&apos;t train right. I was too young. It takes time to make your body grow. You can&apos;t just plant the seed and say, "let the vegetables grow tomorrow." My body was growing and it just needed time and the right training. There were no supplements. I just ate whatever good food I had. "I Just Ate Whatver Good Food I Had." My problem was that I could never put weight on. Until I was 125, 130, and then 140 lbs; it took a couple of years. I used to train so hard I burned all the calories. What was your weight when you were at your peak in the 1940s? 168 lbs. I did a one hand bent press of 285 lbs. I never knew how good I was at the time. I thought it was no big deal. And you traveled the country performing feats of strength? I did this when I got on television in 1950. I was a strongman on the TV show, the very famous kid&apos;s show, called The Sealtest Big Top Circus Show. And there I traveled the country doing feats of strength and exhibitions and everything else. What was the bodybuilding culture like back in the 40s and 50s? Whoever did bodybuilding was considered to be a mental nut job. They went crazy and couldn&apos;t see why people would do this. You have to remember, I started because I had a heart murmur. The exercise cured my heart condition. So bodybuilding helped you to improve your health. What else did you find attractive about the sport back then? I enjoyed running all the WBBG shows that I had. All the worlds best built men appeared at my shows, and I had the greatest bodybuilding shows ever. The highlight for me was to get someone that everyone considered a god to appear. They said I would never get him. He lived in Switzerland at the time. His name was Steve Reeves. I&apos;ll never forget how wild the crowd went. They were uncontrollable. They all wanted to jump up on the stage. That would be one of the highlights of all the shows I ran. What other highlights have there been in your bodybuilding career? The hall of fame honoring dozen&apos;s and dozen&apos;s of bodybuilders and movie stars. What was it like to work with Steve Reeves? What kind of guy was he? A nice guy. We used to visit each other at each others homes. When he used to come to my house, he loved to go up to my attic and put on my Seal test Dan muscleman cape that I wore on the TV. I didn&apos;t know, but from 1950 to 1957 he used to watch the show. At that time he was on a Broadway show called Kismet. But we never really met until the 70s when I honored him. We were very good friends and we used to go to Broadway shows together. In fact I had a big fight with him at one time. People were saying - did you have a fight with Steve Reeves. Yes. A snowball fight. We threw snowballs at one another and he loved it. Living in California, he didn&apos;t see much snow. You have been involved in bodybuilding for a long time. At what period was bodybuilding&apos;s greatest era do you think? The golden age of bodybuilding when they didn&apos;t have steroids. Steroids have ruined bodybuilding, and not only for men. If I ever competed in the women&apos;s division today in my best shape, I wouldn&apos;t even place. They would make me look like a beginner. That is how advanced they are - like men. You know how many dozens and dozens of our greatest athletes have died as a result of these drugs. In 1971 I came out on the cover of Muscle Training Illustrated - my magazine - and alerted the world to the dangers of steroids. I said they were killing our athletes. Now some 35 years later it&apos;s all coming out, what with the baseball and other sports also. It&apos;s getting into the colleges and girls are taking them - they are dying by the dozen. That&apos;s why I campaigned to them to save some lives. In light of what you have just said, what are your thoughts on the current state of bodybuilding? I don&apos;t follow it like I used to, but when I see these people I don&apos;t believe what they look like. They make Sergio Oliva and Arnold look like beginners. They all seem to look the same. Probably using the same bottle of steroids. I don&apos;t know if you heard about this in New Zealand, but Arnold&apos;s calves were very poor when he first began competing, and lost to Frank Zane in his first contest in America. Then all of a sudden his calves went from 17 to over 19 inches. "No, it was a calf transplant." Today he must have lost a lot of weight but his calves are the same size. If you drop a lot of bodyweight your whole body shrinks in proportion. Any doctor examining could tell you if he still has the transplants in his calves. They didn&apos;t want to say that about him. Before you say that you need 100 percent truth. I can only say it was rumored for many many years, but I never printed it. By the way, when Arnold came to this country in 1968, my wife and I were the ones who greeted him and Franco Columbo at the airport. It was good except he did certain things I didn&apos;t like. He used to fondle the girls in the restaurant. Did you get to know Arnold very well? We met a couple of times. We had dinner&apos;s and breakfast&apos;s together. We did TV shows together and he was at the AAU Mr. American shows. He always wanted the publicity and me being a publisher, I could help him. As a publisher what magazines did you have? Besides Muscle Training Illustrated I published Boxing Illustrated, Karate Illustrated, Wrestling illustrated, I had a couple of rock and roll magazines and I had a women&apos;s magazine. How did you get into the publishing business and why? When I broke up with Weider there was no communication to reach bodybuilders for a contest. You can&apos;t get contestants to enter if they don&apos;t know about a show. You can&apos;t get an audience. So I started my magazine in 1965 and I had a partner at the time. After 15 issues he said it wasn&apos;t making money so he wanted out. I knew a little about publishing, but after two and a half years in the industry I got to know quite a bit and I took over the magazine at issue number 16. I started to make money on the first issue I put out because I cut my overheads. He had an office in New York City with secretaries. I didn&apos;t have any of that. I used my own office and my office was my business. All I paid was for running costs for the office, pictures and for an editor. So I had a fixed salary; I would know what each issue was going to cost me. If I didn&apos;t I would have gone broke. 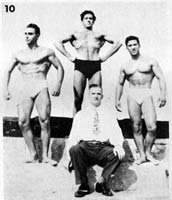 Dan On The Right & Joe Weider In The Center. I wasn&apos;t involved in his magazines, only the barbell and exercise equipment. He lived in Canada at the time and if you ship anything from Canada they charge 10 percent duty tax. When it got to America you had to pay another 10 percent duty tax. So that means whatever was selling was going to have a 20 percent duty tax as well as all the freight costs. It was easier to find someone to ship from the United States. We became partners because he needed someone to help him distribute. Just like Grimek did for Bob Hoffman, he used me in his ads. I was shown as the skinny kid with a weak heart who became America&apos;s most muscular man using his system. That&apos;s what got me disqualified because I was in his ads and I was a professional. John Grimek was always featured in Bob Hoffman&apos;s ads but he was considered an amateur. How did the falling out occur? When we started in business maybe we made about $ 5,000 dollars in each year. That was gross. By the time we got through maybe we made one thousand dollars or five hundred dollars each for the year, which was nothing. But when we started to go over $ 100,000 dollars he didn&apos;t want to share the profits with me. So he just cut my name out of the ads in the magazines and put his own name in. He was established already so he didn&apos;t need me. He is a very unscrupulous guy. No loyalty at all. There are a lot of things I could tell you about him but it will have to wait until my new book is out. 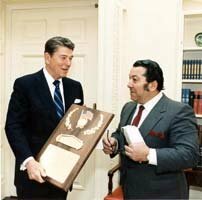 What can you tell me about Joe Weider? "Joe Weider would put a knife in your back. He would use people, and throw them out." All I can say is he was an extremely hard worker, but very ruthless in business. He would put a knife in your back. He would use people, and throw them out. There were lawsuits. He did a lot of bad things. But that was him. That was his character. I introduced him to his first wife. Have you had any recent contact with Mr. Weider? No, I don&apos;t see him. Years ago I heard he was in hospital having a hernia operation so I called him and we spoke for an hour or so. We spoke about the good old days when we were kids. You tend to forget about these things. We went our own ways. I was successful as far as I know, but I always felt I was a fly and he was an elephant. I just wanted to make a living. I started it back in 1965. I never knew I was the creator of the IFBB. Incidentally, Sports Illustrated is going to follow up on this and do a story on how the IFBB name was created by me and how I ran the first IFBB show in America. The World Body Building Guild was very competitive. Joe was always making it his business to run shows on the same day I would run mine in New York City. 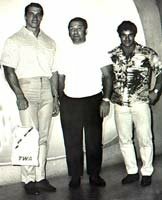 At one time Tom Minichiello, one of my gym members and a good friend, was involved with the IFBB and was told by Weider to bury me. He was told to run the contest the same day Dan Lurie runs his show. Of course I had such complete sell-outs. I never disqualified anyone. I don&apos;t care who you were with. If you were a member of the IFBB and entered any AAU or my shows, you were disqualified. That&apos;s not fair. A bodybuilder is free to do whatever he wants. What did the World Body Building Guild achieve? We started the hall of fame that had a lot of famous people being honored. I even honored President Regan. I read that you arm wrestled President Regan. Tell me about this. Who won? He beat me, twice. I wasn&apos;t going to try to beat him. I wanted to give him respect. Besides, he was the oldest man who ever ran for president and they wanted someone to show how strong and youthful he was. So I helped with this, and I have a good ten minute tape. When we left you know what we did to each other? We hugged and kissed each other. Now that&apos;s something for two men to do. And that&apos;s what we did in the Whitehouse. What else do you remember about this occasion? He said "Dan when I was a kid I used to read all of your ads in the comic books." I said, "Mr. President, what were you doing reading comic books." He said, "I still read them today." He was the president and he still read comic books. That was an amazing thing. He was a down to earth, warm guy. You see, I went there to honor him. I didn&apos;t complain about anything, about what I wanted him to do. I just went there to honor him. We warmed to each other pretty good. And when we arm wrestled, and he beat me, he said "Come on, you dumped it, you let me beat you." I said "No Mr. President, you beat me fair and square." Yes, he used to chop wood on his ranch and horseback ride. We kept in touch after the white house thing. We were supposed to have a rematch but it never happened. It was planned just never happened. The picture of him and me arm wrestling went all over the world. It was on the front page of the New York Times. Many countries featured that picture and ran the story about how the president was so strong he beat a famous strong man. I loved President Regan. He was a warm, decent, down to earth president. What are some of the strength record you have set over the years? I did 1665 pushups in 90 minutes and 1225 parallel dips in 90 minutes. I lifted 285 lbs. with one hand over the head. That one was a specialty. I did 1200 pullovers with 55 lbs. Crazy things. Things that involved endurance. People today don&apos;t do this type of training. They train with heavier weights and they end up with injuries and have to stop for a while. I wasn&apos;t going to get hurt. I found my body responded to hundreds and hundreds of repetitions with a lighter weight - 100 lbs. Yes and I sweated like a pig. I wore a sweatshirt and people would say "don&apos;t drink water while you workout." But I was so thirsty I used to gobble it up. They now say "drink water when you workout, it&apos;s good for you." So who knows. What diet methods have you followed? I always wanted to gain weight so I ate whatever I wanted to. I would lose around three to five pounds every workout. I sweated a lot. Also, I tried not to do much resting in between sets. I rested as little as possible, and it still ended up being a three hour workout. How do you eat today to stay in shape? I eat very lightly, a lot of salads and health foods. And I exercise every morning for about half-an-hour, that&apos;s it. I don&apos;t do too much. I have nothing to prove. What training methods did you establish over the years? When I started manufacturing my own barbells I established the Dan Lurie Barbell Course. I gave it out with a book and pictures and posters. It was very instructive. I was the first one to sell barbells in sporting goods stores. They weren&apos;t sold by York. They were selling main order and I came out selling to stores. From a $ 5,000 dollar a year start it exploded. Many, many years later I was only doing a small amount because I was only one man. What were gyms like in your day? The equipment was mostly very crude and there were a few mirrors. Now everything is chromed. Yes, he came to me at 16 years of age. The first thing I asked him was "how far do you want to go in bodybuilding". "You want to be Mr. America?" He said "Mr. America? I don&apos;t want to be Mr. America.I want to be the best built man who ever lived." That&apos;s right. He had no contract with me. It was more like a friendship. Weider offered him a $50,000 contract for five years. He did that with Arnold - paid him a big amount over a number of years. 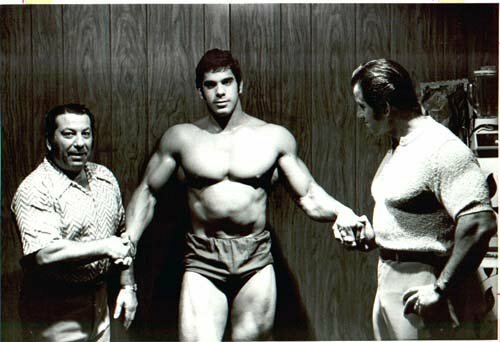 Lou switched the night I had Steve Reeves at my show and his father was upset with me because the year before he lost out to Bill Grant who represented Weider. Lou lost out because he took some sort of water pills. The night before he looked unbeatable and when he came the next day I couldn&apos;t believe the change. I don&apos;t know what the heck he was doing. He lost all his definition. How would you like to be remembered Dan? I would like to be remembered as a bodybuilder who loved bodybuilding and treated everyone fair and square. I never hurt any athlete. There were two bodybuilders who sued me - Lou Ferrigno and Arnold. I never said a word about it in my magazine. Now Weider claims he discovered Ferrigno. Bullsh*t. It&apos;s a lie. I said "Joe, you and I are both Jewish, why are you reading the books on Hitler?" He says, "Think of the power the man had." Just like he said he started the IFBB in 1946. That&apos;s a lie. We have all the old issues and his involvement is not even mentioned. We are doing the research now. He gave me a third page in the Your Physique Magazine when I ran the January 15, 1948 show. He lied and made up stories and people believed it. Joe was a big reader of the Hitler books. He was a 19 year old kid. Who is looking for power at that age. One of Hitler&apos;s sayings was, if you print a lie often enough people will come to know it as the truth. That&apos;s what Joe does. What is most important to you Dan? The most important thing in my life is my wife, my five children and 15 grand children, and soon to be three great grandchildren. That&apos;s the most important thing in my life. Not money. Weider, with all the money he could ever want, has no children although there was some talk around him having a girl at some stage, but who knows. Finally, what are the secrets to a long and healthy life? There is no secret. It is all in God&apos;s hands. When I was a kid they said I would live to about five or six years old. People who are healthy die of heart attacks in their 30s 40s and 50s. People in their 70s and 80s... all their lives live until their late 90s. It&apos;s all in God&apos;s hands. We don&apos;t know.